Disclosure: I received placement on the giveaway form. No compensation received. Don't these look delicious? Before partnering up for this event, I hadn't heard of Funley's. So I checked them out, and seriously, every flavor and type looks delicious. These are definitely a snack I want to try! Anyway, I'll leave you all to the giveaway. Have fun, and good luck! 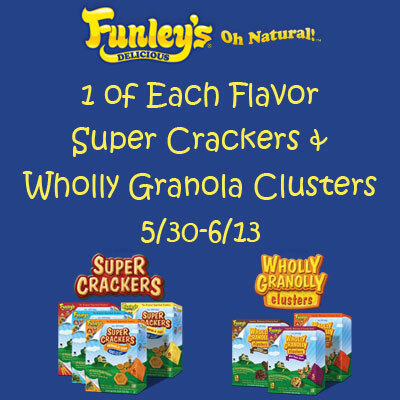 Funley’s Delicious is the creator of 2 great varieties of snacks, Super Crackers and Wholly Granola Clusters. Super Crackers contain super foods hidden inside such as broccoli, sweet potato, carrots and spinach, but you would never know by tasting them." Rats and More did not receive compensation for this post and is not responsible for prize fulfillment. I love all snacks. :) Almonds are great! Usually something salty like chips or pretzels.